I would like to add some text to the default forums page. Is there a way to do this? Perhaps a plugin? Copy and paste the template files you would like to edit from the bbPress plugins folder to your theme folder. The Forum ‘ home-page ‘ is known as an Archive template. Copy it to your theme folder. screenshot! – Remember don’t Drag-/Drop it over but Copy-/Paste it. but with only one x – sorry but even with code ticks the forum interprets this code, so cannot put it in exactly! by the way the page doesn’t appear as an edit option in the toolbar, so you have to edit it via the dashboard, but that is how I achieved it. Thank you, Shmoo. I will try it. Robin, I tried that first but the breadcrumbs led back to the default forums page. Did you call the page forums plural? I know this is an old thread so perhaps I’m out of luck, but I’m having the same problem as pkl. The breadcrumbs lead back to the default forum page, which doesn’t configure properly with my theme (Optimize Press 2). It just looks like a jumble of letters and numbers. The page that I have put the forum index on is http://www.themusiciangirl.com/community-forum/. Notice the slug: “community-forum.” I then went into the forum settings and changed the root slug to “community-forum.” When I went back to the page, all of my hard work putting together a nice looking layout had disappeared. The default forum page had appeared. I changed the forum root slug back to the default “forums” and re-visited the community-forum page. It looked good again, with all my formatting nicely done. However, once I click on a forum or topic, then voila, it looks gross again. I want to be able to make my nicely formatted community-forums page the default index page that the breadcrumbs lead back to. Any tips? Guys, I DID IT! After spending the better part of a day sweating over this problem, I finally fixed it. The solution is so simple, I have no idea why it took me so freaking long to think of it! 3. Once you’re on the editing page, scroll down to where your new plugin has two, magic little options for you. The first one, “this is a normal wordpress page,” is probably checked. Instead, check the one right below it, the one that says “custom url” or something like that. Enter the url for the page that you WANT your default forums page to be. Click publish. TA-DA! Now, when you click on “forums” in your breadcrumbs trail, instead of taking you to that default index page, it’ll take you to the special one that you made using the index shortcode. Thanks Maya! I was having the same problem, and this fix/workaround worked for me as well. I hadn’t realized it before because I hadn’t tested it, but we’re still having the same problem as previously described with our forum search functionality. i.e. 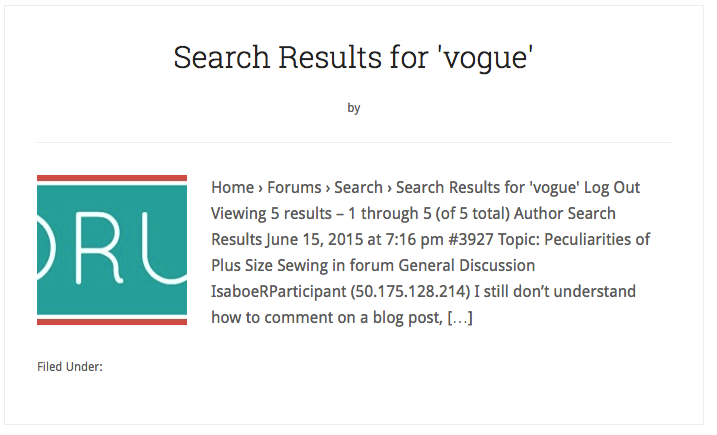 When a user searches a term in the bbpress forum, the results show a line of gibberish, not search results. Is there a setting somewhere that I can tweak so that it shows our “forums” page search results? post an image of the line of gibberish. Here’s a screenshot of the gibberish. Note that this is exactly what was happening with our forum breadcrumbs/landing page when I first joined this team, and we didn’t have our forums page (in our “Pages”) configured correctly. What I’m guessing is happening here is that there’s some setting in the bbpress forums search widget that we need to re-configure, but I don’t know what setting that is. Twenty Fifteen had something similar to that issue. The resolution to the issue in Twenty Fifteen was to follow to copy all the bbPress templates from the plugin to your child theme in a folder called bbpress. I had seen that suggested as a fix to the breadcrumbs issue that we’d experienced before. I’m aware that the fix that I implemented for that is probably more of a workaround than anything else. Unfortunately, I don’t have the FTP login/password combo to our site, and I’m not entirely sure who has that (if anyone), so that will require some legwork to hunt down. If there’s a workaround where I can avoid FTP’ing files to copy them, that would be preferable. You also modify the main template that bbPress uses but this would also require FTP data. You should contact your host to find the FTP data you have.